COVENTRY – State Representative Tim Ackert (R-8) and Children’s Librarian Meg Schiebel of the Booth Dimock Memorial Library recognized ten children who have recently completed the ‘1,000 Books Before Kindergarten’ program. “It is extremely important to get children involved in reading at an early age because it promotes a desire to continue reading as they get older,” Rep. Ackert said. “Completing this challenge is incredibly impressive, I don’t think I’ve gotten to 1,000 books quite yet,” Ackert joked. The goal is to engage families in their child’s pre-K education, and help them grow the necessary skills to succeed once they enter school. With every new book read, parents helped the children keep track of their progress by logging their books, either by paper or via a mobile app. After completing every 100 books, journals are then brought to the library where the child is awarded a sticker. If you or someone you know is interested in signing up their child or grandchild for this program, please visit the Booth and Dimock Memorial Library’s link here. 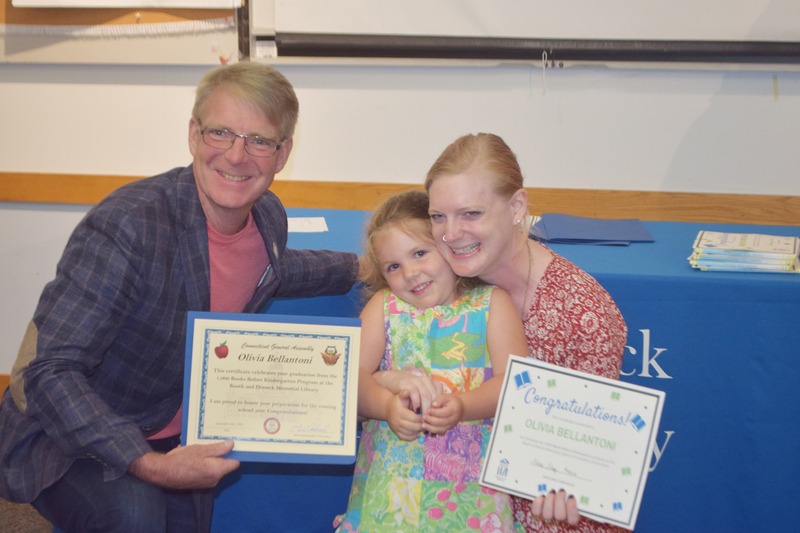 State Representative Tim Ackert and Children’s Librarian Meg Schiebel present Olivia Bellantoni with certificates for completing the ‘1,000 Books Before Kindergarten’ program.